37 CFR 1.321 Statutory disclaimers, including terminal disclaimers. Pre-AIA 37 CFR 1.321 Statutory disclaimers, including terminal disclaimers. 35 U.S.C. 253(a) corresponds to the provisions of pre-AIA 35 U.S.C. 253, first paragraph except that the first sentence of pre-AIA 35 U.S.C. 251 includes the phrase “without any deceptive intention” between “Whenever” and “a claim.” Effective September 16, 2012, Public Law 112-29, sec. 20, 125 Stat. 284 (Leahy-Smith America Invents Act (AIA)), amended 35 U.S.C. 253 to eliminate the “without any deceptive intention” clause. 35 U.S.C. 253(b) corresponds to the provisions of pre-AIA 35 U.S.C. 253, second paragraph. There are two types of disclaimers: a statutory disclaimer and a terminal disclaimer. A statutory disclaimer is a statement in which a patent owner relinquishes legal rights to one or more claims of a patent. A terminal disclaimer is a statement in which a patentee or applicant disclaims or dedicates to the public the entire term or any terminal part of the term of a patent or patent to be granted (filed in an application). Although a statutory disclaimer and a terminal disclaimer are both provided for by statute, the manner in which the two terms have been used historically distinguishes them. The phrase “statutory disclaimer” is used to denote a disclaimer of one or more claims of an issued patent whereas the phrase “terminal disclaimer” is used to denote a disclaimer of the entire term or any terminal part of the term of a patent or a patent to be granted. As noted above, a statutory disclaimer is a statement in which a patent owner relinquishes legal rights to one or more complete claims of a patent. A statutory disclaimer is not, however, a vehicle for adding or amending claims, because there is no provision for such in the statute (35 U.S.C. 253) nor the rules (37 CFR 1.321). Thus, claims of a patent cannot be disclaimed in favor of new claims to be added to the patent or an amendment to existing claims. 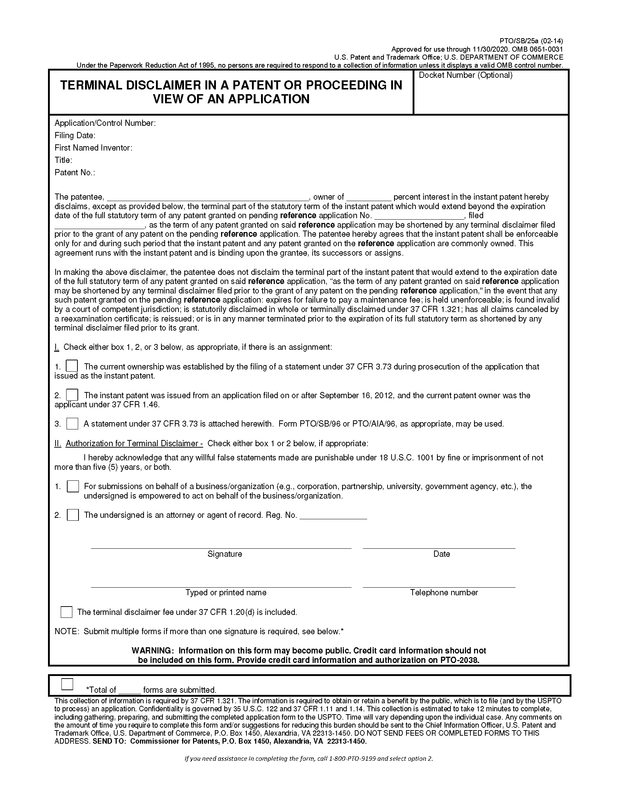 The word “applicant,” in this context, refers to the inventor or all of the joint inventors, or to the person applying for a patent as provided in 37 CFR 1.43, 1.45, or 1.46. Under 37 CFR 1.43, “applicant” refers to the legal representative of a deceased or legally incapacitated inventor. Under 37 CFR 1.45, “applicant” refers to the inventors; if fewer than all joint inventors are applying for a patent as provided in 37 CFR 1.45, the phrase “the applicant” means the joint inventors who are applying for the patent without the omitted inventor(s). Under 37 CFR 1.46, “applicant” refers to the assignee, the person to whom the inventor is under an obligation to assign the invention, or the person who otherwise shows sufficient proprietary interest in the matter, who is applying for a patent under 37 CFR 1.46 and not the inventor. In order to obviate a non-statutory double patenting rejection, the entirety of the ownership must sign the terminal disclaimer disclaiming with respect to the reference on which the rejection is based, or multiple terminal disclaimers so disclaiming. Thus, if a 37 CFR 1.321(b)(1) applicant who is not the owner (e.g., an inventor who assigned away the rights to the application) signs a terminal disclaimer, the terminal disclaimer will not be entered and the non-statutory double patenting rejection will not be withdrawn by the examiner. The same is true if a 37 CFR 1.321(b)(1) applicant representing less than the entirety of the ownership (see 37 CFR 1.42(c)) signs a terminal disclaimer, and a terminal disclaimer from the remainder of the ownership has not also been filed. (2) specifying in the record of the application or patent where such evidence is recorded in the Office (e.g., reel and frame number, etc.). The submission with respect to pre-AIA 37 CFR 3.73(b) to establish ownership must be signed by a party authorized to act on behalf of the assignee. See also MPEP § 324 as to compliance with pre-AIA 37 CFR 3.73(b). 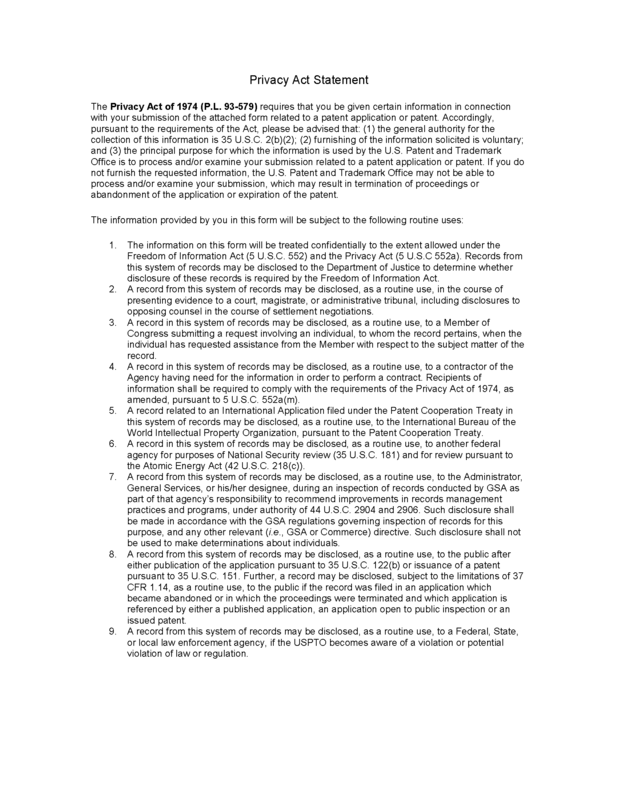 A copy of the “Statement Under 37 CFR 3.73(b),” which is reproduced in MPEP § 324, may be sent by the examiner to applicant to provide an acceptable way to comply with the requirements of pre-AIA 37 CFR 3.73(b). 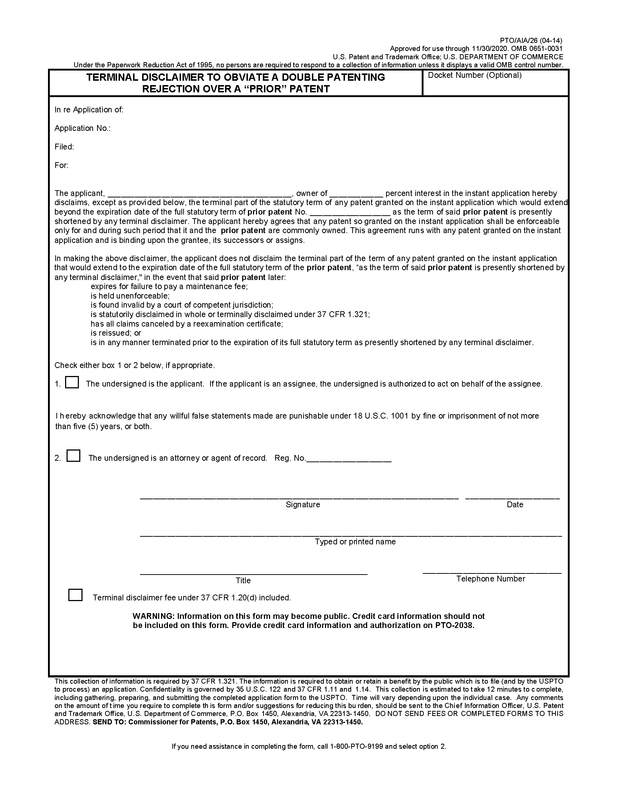 A statement of assignee interest in a terminal disclaimer that “A and B are the owners of 100% of the instant application...” is sufficient to satisfy the pre-AIA 37 CFR 1.321(b)(3) requirement that a terminal disclaimer “state the present extent of applicant’s or assignee’s ownership interest in the patent to be granted.” Although the quoted statement does not identify what specific percentage is owned by A and what specific percentage is owned by B, the statement does provide consent to the terminal disclaimer by the entirety of the ownership of the application (A and B own all of the invention, regardless of the individual percentages they own). A proper terminal disclaimer must disclaim the terminal part of the statutory term of any patent granted on the application being examined (or the statutory term of the patent) which would extend beyond the expiration date of the full statutory term, shortened by any terminal disclaimer, of the patent (or of any patent granted on the application) to which the disclaimer is directed. Note the exculpatory language in the second paragraph of the sample terminal disclaimer forms, PTO/SB/25, PTO/SB/25a, PTO/SB/26, PTO/SB/26a, PTO/AIA/25, and PTO/AIA/26, provided at the end of this Chapter. That language (“In making the above disclaimer, the owner does not disclaim...”) is permissible in a terminal disclaimer. A terminal disclaimer filed to obviate a nonstatutory double patenting rejection is effective only with respect to the application or patent identified in the disclaimer unless by its terms it extends to continuing applications (in which case, applicant must file a copy of the disclaimer in the continuing application, to obviate any nonstatutory double patenting rejection to which the disclaimer is directed). See President and Fellows of Harvard College v. Rea, No. 1:12-CV-1034, 2013 WL 2152635 (E.D.Va. May 15, 2013). For example, a terminal disclaimer filed in a parent application normally has no effect on a continuing application claiming filing date benefits of the parent application under 35 U.S.C. 120. A terminal disclaimer filed in a parent application to obviate a nonstatutory double patenting rejection does, however, carry over to a continued prosecution application (CPA) filed under 37 CFR 1.53(d) (effective July 14, 2003, CPAs are only available in design applications). The terminal disclaimer filed in the parent application carries over because the CPA retains the same application number as the parent application, i.e., the application number to which the previously filed terminal disclaimer is directed. 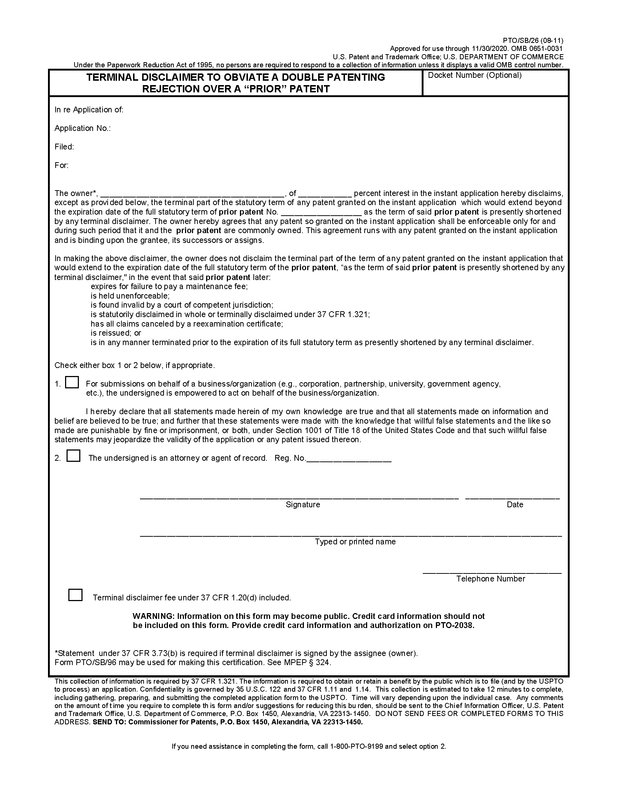 If applicant does not want the terminal disclaimer to carry over to the CPA, applicant must file a petition under 37 CFR 1.182, along with the required petition fee, requesting the terminal disclaimer filed in the parent application not be carried over to the CPA; see below “Withdrawing a Terminal Disclaimer” (paragraph “A. Before Issuance of Patent”). 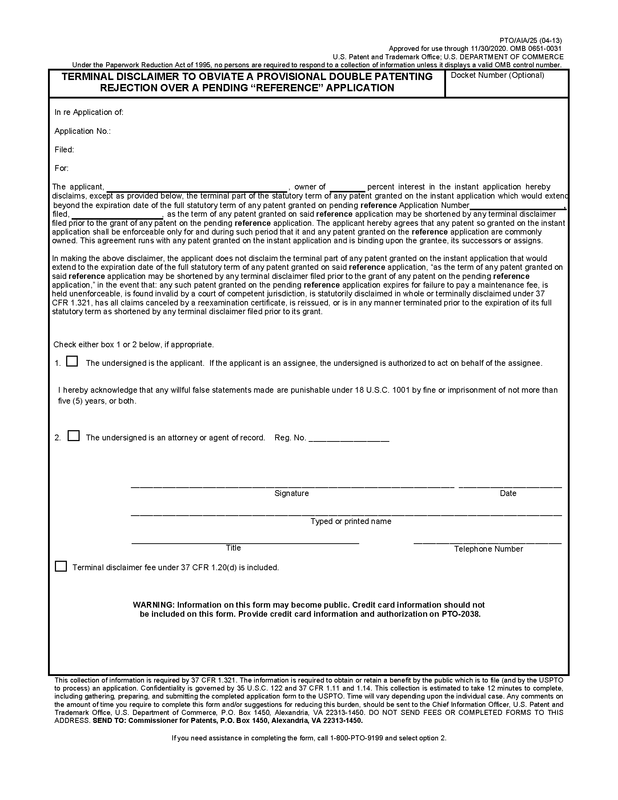 If applicant files a Request for Continued Examination (RCE) of an application under 37 CFR 1.114 (which can be filed on or after May 29, 2000 for an application filed on or after June 8, 1995), any terminal disclaimer present will continue to operate, because a new application has not been filed, but rather prosecution has been continued in the existing application. A petition under 37 CFR 1.182, along with the required petition fee, may be filed, if withdrawal of the terminal disclaimer is to be requested. Benefit claims under 35 U.S.C. 119(e) and foreign priority claims under 35 U.S.C. 119(a)-(d) or (f), 365(a) or (b), or 386(a) or (b) are not taken into account when determining the term of an issued patent (see 335 U.S.C. 154(a)(2) and (a)(3)), and therefore, are not taken into account in determining which application is the earliest-filed application. 5. For improper terminal disclaimers, see form paragraphs 14.24et seq. It is directed to a particular claim or claims, which is not acceptable, since “the disclaimer must be of a terminal portion of the term of the entire [patent or] patent to be granted.” See MPEP § 1490. 1. 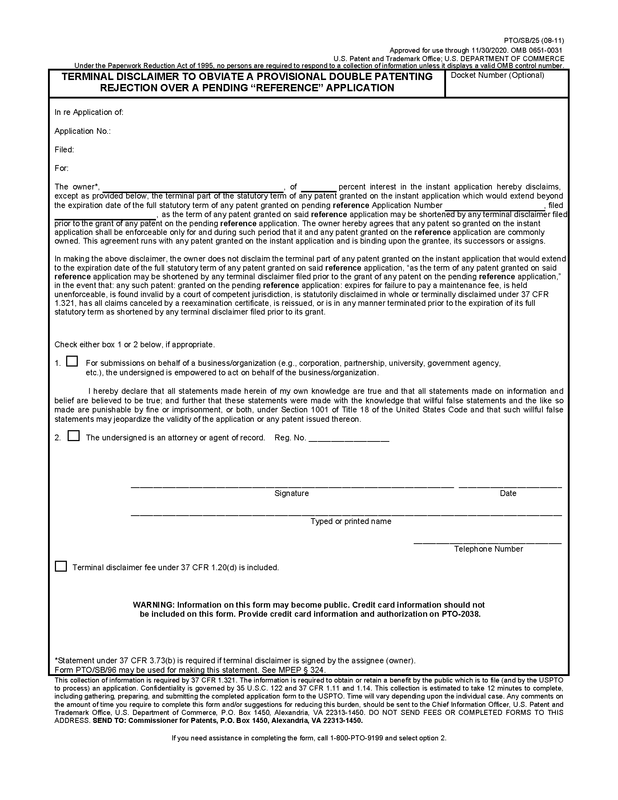 This form paragraph is to be used ONLY in applications filed before September 16, 2012 when the person signing the terminal disclaimer is not an authorized officer as defined in MPEP § 324 or is an attorney or agent not of record (e.g., acting in a representative capacity under 37 CFR 1.34). This application was filed before September 16, 2012. The assignee has not established its ownership interest in the application, in order to support the terminal disclaimer. There is no submission in the record establishing the ownership interest by either (a) providing documentary evidence of a chain of title from the original inventor(s) to the assignee and a statement affirming that the documentary evidence of the chain of title from the original owner to the assignee was, or concurrently is being, submitted for recordation pursuant to 37 CFR 3.11, or (b) specifying (by reel and frame number) where such documentary evidence is recorded in the Office (37 CFR 3.73). The assignee has not established its ownership interest in the patent, in order to support the terminal disclaimer. 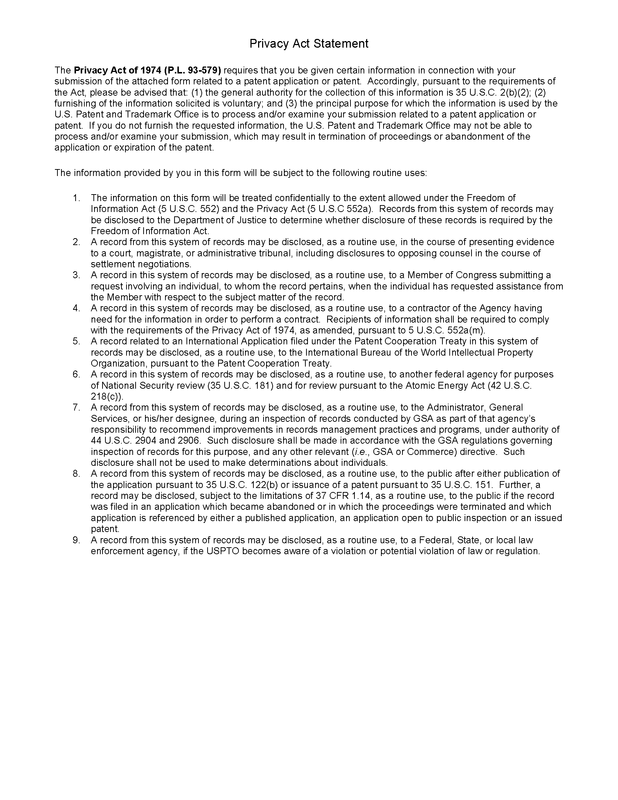 There is no submission in the record establishing the ownership interest by either: (a) providing documentary evidence of a chain of title from the original inventor(s) to the assignee and a statement affirming that the documentary evidence of the chain of title from the original owner to the assignee was, or concurrently is being, submitted for recordation pursuant to 37 CFR 3.11; or (b) specifying (by reel and frame number) where such documentary evidence is recorded in the Office (37 CFR 3.73). This application was filed before September 16, 2012. The submission establishing the ownership interest of the assignee is informal. There is no indication of record that the party who signed the submission establishing the ownership interest is authorized to sign the submission (37 CFR 3.73). A terminal disclaimer may be effective to overcome a provisional nonstatutory double patenting rejection over a pending application (37 CFR 1.321(b) and (c)). A terminal disclaimer may be effective to overcome a nonstatutory double patenting rejection over a reference patent (37 CFR 1.321(b) and (c)). While the filing and recordation of an unnecessary terminal disclaimer has been characterized as an “unhappy circumstance” in In re Jentoft, 392 F.2d 633, 157 USPQ 363 (CCPA 1968), there is no statutory prohibition against nullifying or otherwise canceling the effect of a recorded terminal disclaimer which was erroneously filed before the patent issues. Likewise, a terminal disclaimer that was erroneously filed in a reexamination proceeding may be withdrawn before issuance of the reexamination certificate. Because the terminal disclaimer would not take effect until the patent is granted (or the reexamination certificate is published), and the public has not had the opportunity to rely on the terminal disclaimer, relief from this unhappy circumstance may be available by way of petition or by refiling the application (other than by refiling it as a CPA). The mechanisms to correct a patent — certificate of correction (35 U.S.C. 255), reissue (35 U.S.C. 251), reexamination (35 U.S.C. 305 and pre-AIA 35 U.S.C. 314), inter partes review (35 U.S.C. 316), post grant review (35 U.S.C. 326), and covered business method review — are not available to withdraw or otherwise nullify the effect of a recorded terminal disclaimer. As a general principle, public policy does not favor the restoration to the patent owner of something that has been freely dedicated to the public, particularly where the public interest is not protected in some manner — e.g., intervening rights in the case of a reissued patent. See, e.g., Altoona Publix Theatres v. American Tri-Ergon Corp., 294 U.S. 477, 24 USPQ 308 (1935). Although the remedial nature of reissue (35 U.S.C. 251) is well recognized, reissue is not available to correct all errors. Reissue is not available to withdraw or otherwise nullify the effect of a terminal disclaimer recorded in an issued patent. 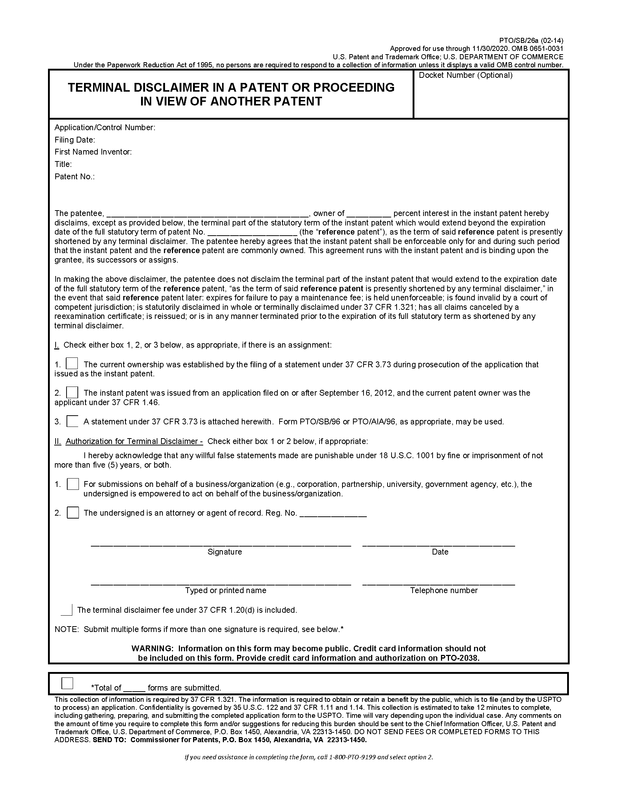 First, the reissue statute only authorizes the Director of the USPTO to reissue a patent “for the unexpired part of the term of the original patent.” Because the granting of a reissued patent without the effect of a recorded terminal disclaimer would result in extending the term of the original patent, reissue under these circumstances would be contrary to the statute. In In re Yamazaki, 702 F.3d 1327, 1332, 104 USPQ2d 2024, 2028 (Fed. Cir. 2012), the Federal Circuit stated, as to a terminal disclaimer submitted for a patent, that the statutory patent term calculation begins but does not end with 35 U.S.C. 154(a). When a patent issues subject to a terminal disclaimer, the patentee has reduced the patent’s statutory term by effectively eliminating the disclaimed portion from the original patent, by operation of 35 U.S.C. 253 (which indicates that a disclaimer of patent claims “shall thereafter be considered as part of the original patent” and such applies to disclaimers of patent term). Id. Second, the principle against recapturing previously patented subject matter that has been intentionally dedicated to the public dates back to Leggett v. Avery, 101 U.S. 256 (1879). The attempt to restore that portion of the patent term that was dedicated to the public to secure the grant of the original patent would be contrary to this recapture principle. Finally, applicants have the opportunity to challenge the need for a terminal disclaimer during the prosecution of the application that issues as a patent. “Reissue is not a substitute for Patent Office appeal procedures.” Ball Corp. v. United States, 729 F.2d 1429, 1435, 221 USPQ 289, 293 (Fed. Cir. 1984). Where applicants did not challenge the propriety of the examiner’s nonstatutory double patenting rejection, but filed a terminal disclaimer to avoid the rejection, the filing of the terminal disclaimer did not constitute error within the meaning of 35 U.S.C. 251. Ex parte Anthony, 230 USPQ 467 (Bd. App. 1982), aff’d, No. 84-1357 (Fed. Cir. June 14, 1985). In In re Dinsmore, 757 F.3d 1343, 111 USPQ2d 1229 (Fed. Cir. 2014), the Federal Circuit held that the filing of a terminal disclaimer to obviate a double patenting rejection over a prior patent, when the prior patent and the patent sought to be reissued were never commonly owned, was not an error within the meaning of the reissue statute. In rejecting applicants' argument, the Dinsmore court noted that applicants had not shown a mistaken belief that the two patents at issue were commonly owned, and stated that the applicants were ultimately seeking to revise a choice they made, not to remedy the result of a mistaken belief. Finally, the nullification of a recorded terminal disclaimer would not be appropriate in reexamination, inter partes review, post grant review, and covered business method review proceedings. There are statutory prohibitions in 35 U.S.C. 305 and pre-AIA 35 U.S.C. 314, 35 U.S.C. 316, and 35 U.S.C. 326 against enlarging the scope of a claim during reexamination, inter partes review, post grant review, and covered business method review proceedings. As noted by the Board in Anthony,supra, if a terminal disclaimer was nullified, “claims would be able to be sued upon for a longer period than would the claims of the original patent. Therefore, the vertical scope, as opposed to the horizontal scope (where the subject matter is enlarged), would be enlarged.” Id. at 470.